Ask a traveller about North-east India and you will hear gushing reports of ‘paradise unexplored’, ‘mesmerising mountainous terrain’ and ‘mighty rivers’. Shivakumar L brings to you the tales of nature’s marvellous engineering from the land of the Khasi and Garo — the root bridges of Meghalaya. Most of humanity’s modern bridge-building legacy is a story of artificial structures crafted out of manmade materials and guided by high-level engineering. What we find in Meghalaya, however, is a lovely exception to the rule. Long ago, the Khasi tribe in the state came upon a tree, and in its powerful and strong roots found an opportunity to cross the region’s many rivers and streams. Known as Rubber fig (Ficus elastica), this tree produces several secondary strong roots higher up its trunk; which can branch out over huge boulders along the riverbanks, forming a natural, and yes, a living bridge for the natives to get to the other side. In order to make the roots grow in the right direction, the Khasis use betel nut trunks, sliced down the middle and hollowed out, to create a guide and anchor for the roots. The trunks prevent the thin, tender roots of the rubber tree from fanning out. Once the roots reach the other side they are made to grow into the soil; this process may take at least a decade if not more. A number of these natural bridges can be over 100 feet long and may take 10-15 years to become completely functional. Some bridges are also created by intertwining the roots of trees on either side of the bank, which are then bounded and held in place by huge boulders. Once formed, they’re extremely sturdy and can take the weight of even fifty people at once. The most captivating part of this entire process is that because these roots are alive and still growing, they gain strength and become sturdier over time, unlike concrete bridges which tend to weaken and crumble. 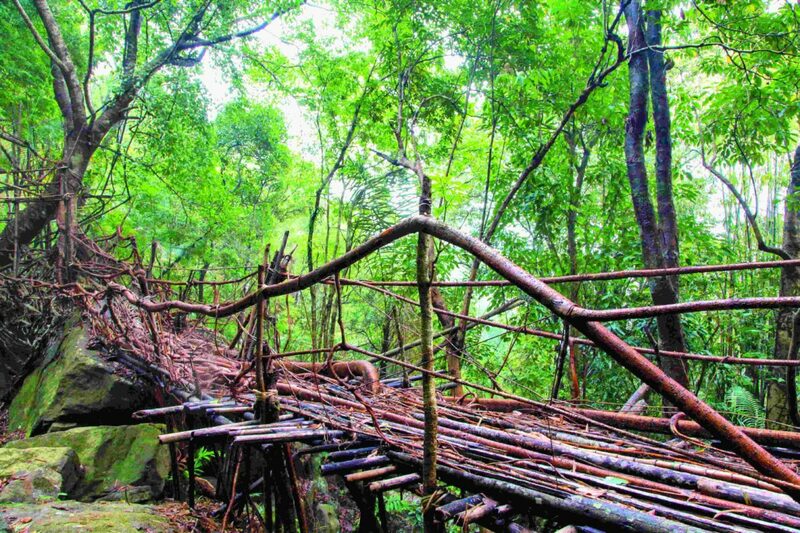 Known in Khasi as Jingkieng Deingjri (bridge of the rubber tree), the structures may be anywhere from 10–30 metres in span. One can even come across root bridges that are over 500 years old. The most famous of them all, which even the current generation is proud of, is the ‘Umshiang Double-Decker Root Bridge’ in Nongriat village—known to be one of its kind. Unlike most artificial structures, these are able to withstand the high level of soil erosion brought about by rains, and being living material rather than dead wood, they are resistant to the ravages of termites. These bridges are used regularly by the natives from surrounding villages even to this day. To see the Umshiang Double-Decker Root Bridge, you must first get to Shillong, the capital of Meghalaya. You can fly into Guwahati and get a taxi all the way to Shillong; takes about three hours including a tea break. To reach Nongriat, one needs to get to Tyrna village, where the road ends and the hiking path starts. The walk initially begins with 2,000 steps down the hill on a well-laid concrete pathway, leading to a village from where you pass along metal bridges, cross numerous ups and downs until you finally reach the double-decker bridge. Apart from this, there are 11 functional root bridges in this area, including Ummunoi, Umkar, Ritymmen and Mawsaw among others. Monsoon in Meghalaya is generally between May and October. It’s best to plan well in advance than face the torrential rains that simply do not stop in these parts; being one of the rainiest places in the world.